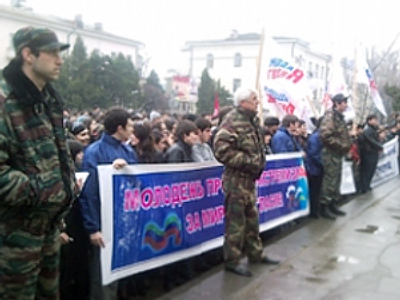 More than 5,000 citizens gathered in the towns of Khasavyurt and Makhachkala in the southern region of Dagestan to protest the terrorist acts in Moscow and Kizlyar. On Wednesday a similar rally happened in Moscow. Both rallies featured minutes of silence in commemoration of those who died as a result of the blasts. The rally in Khasavyurt lasted about an hour, with participants urging a stop to the terrorist violence and asking not to associate it with the Muslim religion. The rally in Makhachkala featured slogans like “Stop the killing!”, “Youth defies extremism!” and “We mourn!” Speakers at the rally urged Russian citizens to unite against the terrorism.